You've heard about income inequality—about how, for example, the top 10 percent of Americans control more than half of all income. But we've heard less about inequality when it comes to retirement savings. 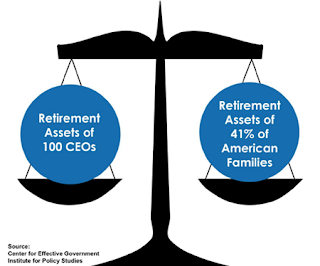 According to a report released this week by the Center for Effective Government and the Institute for Policy Studies, just 100 CEOs have retirement accounts that total $4.6 billion—that's more than the retirement assets of 41 percent of Americans, or 116 million people. The authors used SEC filings to examine the 100 largest retirement accounts among Fortune 500 CEOs, and found that the average CEO has saved up $49.3 million for retirement. By contrast, the median balance in 401(k) accounts at the end of 2013 was $18,433. And the majority of people of color and female heads of household have no retirement assets. Without a pension, IRA, or 401(k) account, these individuals will be completely dependent on Social Security when they do retire—and the average Social Security benefit is $1,223 per month (click on image). So, what's going on here? Nari Rhee, a researcher who studies retirement disparities at the University of California-Berkeley Labor Center, says a number of factors make the retirement gap so big. First, of course, is the income gap: Full-time, working women make 78 percent of what men do; the median wealth of white households is 10 and 13 times that of Latino and black households, respectively. And with less money, there's less to stow away for the future. But in addition, people of color are more likely to invest the money that they do save on housing or a business than in stocks, bonds, or mutual funds. The fallout: People of color were hit harder by the collapse of the housing market in 2008. And finally, says Rhee, people of color are less likely to work in jobs that offer retirement benefits, particularly since so many jobs are concentrated within low-wage or part-time work in the private sector (think food service or manufacturing, construction, manufacturing, or janitorial staff). All of this together helps create financial disparity during retirement: one in five retired Latino Americans and about one in six retired blacks live under the poverty line, compared with about 1 in 15 whites. The report calls for a cap on deferred compensation and an expansion of Social Security benefits and public pensions. Without changes, says Anderson, "We're really looking at a retirement crisis where you’re going to have millions of seniors with unmet basic needs and, on the other hand, a privileged few corporate executives with platinum pensions." I touched upon the gross inequity in retirement income in my weekend comment on the quiet screwing of America but this article breaks it down and demonstrates the stark contrast among racial and gender lines. Not surprisingly, America's retirement crisis is disproportionately hitting women and people of color but it's also hitting many hard working white Americans who are unable to save for retirement and even if they do manage to save, they're living a 401(k) nightmare, all part of a de facto retirement policy that has failed millions of Americans. But have no fear, Blackstone is here, and if Tony James gets any traction on his solution to America's retirement crisis, pretty soon every American will be saving and investing like U.S. public pensions, paying inordinate fees to private equity and hedge funds that are underperforming the market. Don't worry folks, this is all part of Wall Street's license to steal. As long as the "big boys" and the "big banks" that service them make off like bandits, it doesn't matter if millions of Americans are falling through the cracks, condemned to pension poverty. This is how trickle down economics works: "'If you feed enough oats to the horse, some will pass through to feed the sparrow." And what are U.S. politicians doing to address America's looming retirement crisis? They're enabling it, doing everything wrong by weakening Social Security instead of bolstering it and hiking pension premiums for companies making it easier for them to drop defined-benefit plans. No U.S politician is willing to accept the brutal truth on DC plans. Worse still, you have politicians like Chris Christie who publicly decry government stealing from retirees at GOP debates as his state government funnels hundreds of millions in financial fees to Wall Street. It's enough to make you sick. I used to think America's retirement crisis is a slow motion train wreck. Now I realize, just like the heroin epidemic, it's more like a speeding train heading off a cliff and for millions, the American dream is turning out to be a living nightmare.